Conferences, workshops, and business events are at an all time high. Monthly, or even weekly, someone is hosting one that promises to do one thing or another. Unfortunately, attendees often leave feeling like they’ve wasted their time and hard earned money! But you can rest assured that showing up to The Next Level Reception is a step in the right direction! You could be the winner of “Private Cocktails” with former NFL Player of the Tennesee Titans, Rennie Curran. Bring Your “A” Game! Treat Yourself Better; Come to the Table! We recognize that all steps, in your journey to success, matter! So this event is designed to infuse you with positive influencers. Whether you’re tiptoeing like a novice or leaving footprints like an expert, there’s always room for growth. And in order to get where you’re going, it’s imperative to learn from those with insight. So we’ve invited pertinent people to push you into position! 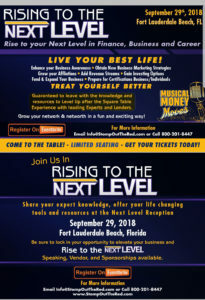 If you’re ready to rise to your next, the very next thing you should do is solidify your spot at this reception! Seating is limited and registration is required. Don’t wait until it’s too late! Our Experts and Lenders will provide the knowledge and resources to rise you to the next level. 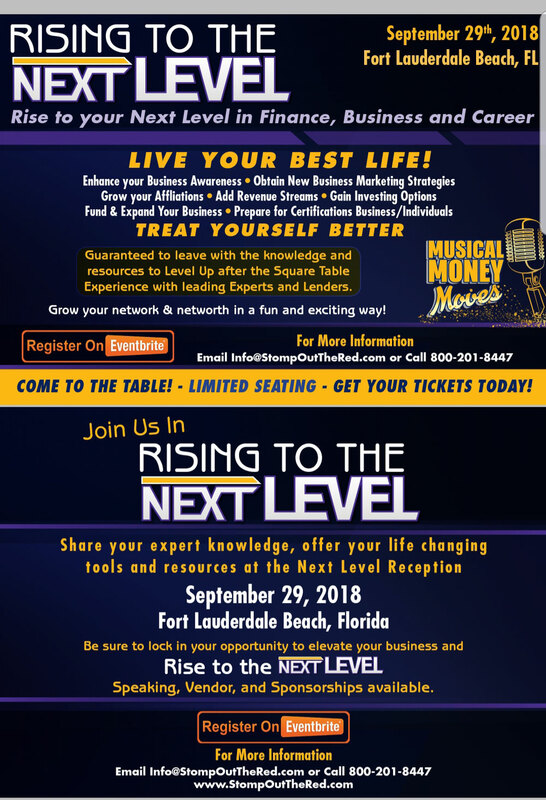 Level Up in Finance, Business or your Career! Hors d’oeuvres will be served to fuel your natural body and music delivered by DJ Big Man Kelly of HOT 105, he will put rhythm in your feet that’ll help you dance your way into opulence! Win a chance to CRUISE INTO PROSPERITY with a VIP ticket to Stomp Out The Red!